"This is a delicious and colorful salad certain to please friends who appreciate unusual cuisine!" To prepare the dressing, place extra virgin olive oil, red wine vinegar, brown sugar, and pepper in a small container with a lid. Shake well to blend. 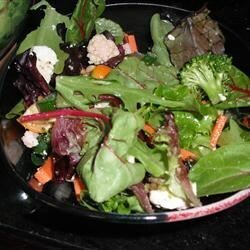 In a medium bowl, toss together baby salad greens, green onions, celery, carrot, broccoli, and cauliflower. Sprinkle avocado with lemon juice, and toss into the mixture. Sprinkle mixture with Asiago cheese and pine nuts. Toss in kumquats. Serve with the olive oil dressing. One of the best salads I have ever tasted! All my family loves it and everyone I have told about it ask for the recipe! I used raspberry vinegar rather than balsamic and it was delicious! Served at a dinner party and everyone raved about it.